In National Geographic’s new TV series, Elon Musk reaches for the stars. In 1955, Werner von Braun teamed up with Walt Disney to produce a three-part TV series laying out America’s spacefaring future. With a record-smashing viewership of 40 million people for its first episode, “Man in Space” played a decisive role in putting the challenge of sending men to the Moon squarely in the mind of the nation. Just 14 years later, we were there. Now, with the soon-to-start six-part National Geographic TV series Mars, acclaimed filmmaker Ron Howard (Apollo 13) aims to repeat the same feat but this time specifically with the Red Planet squarely in his sights. As for the documentary side of the epic, the focus is heavily on Elon Musk and his team at SpaceX who are going all out to reach for the Red Planet. This may irritate a lot of those working in the Mars-mission community — for example, those in and around program led by NASA’s Jet Propulsion Laboratory. They have sent 17 successful and five unsuccessful probes to Mars, a record that compares favorably to that of the SpaceX effort, which has sent none of either. It is will also annoy the legions of those who dislike Musk because they find his competition, politics, business practices, or personality disagreeable. But speaking as one who knows Musk, and who is neither a Musk hater nor a member of his fan club (I recently penned a critical review of his much-hyped, quite impractical, and yet very interesting design for an interplanetary spaceship) I think the focus on Musk is right. Every epic needs a hero, and Musk is just that: a hero for our time. By that I don’t mean that he is an ideal person. I mean that he is a person who craves what the ancient Greeks called “kleos,” eternal glory for doing great deeds, and is willing to put everything on the line to get it. He is anything but selfless, but he is not driven by money, or a desire for cheap fame of the Paris Hilton or Donald Trump variety. No, he wants kleos. The fewer men, the greater the share of honour. God’s will, I pray thee wish not one man more. By Jove, I am not covetous for gold . . .
That’s Musk to a T. It’s what makes him somewhat irksome at times, but also what makes him an asset to humanity. And there can be no question that regardless of his penchant for hype, his accomplishments are very real. By taking an extremely daring approach, he has demonstrated the ability to develop new space-flight systems at one tenth the cost and one third the time that was previously accepted as normal in the aerospace industry. Not only that, he has developed things that the mainline industry, working for half a century before him, never even attempted to create, such as reusable rocket-booster stages that land on their takeoff pads using supersonic retropropulsion. This trick was science fiction three years ago, but it has now has so altered the technological landscape that it has made NASA’s Space Launch System obsolete before its first flight, not to mention that it could enable such things as intercontinental rocketplanes that will be able fly anywhere on Earth from anywhere else in less than an hour. Naturally, the crew in the Mars story uses this technique to land its ship on the Red Planet. Why wouldn’t it? In short, Musk has Sputniked NASA and set a new paradigm for future space flight. Will he himself succeed in pulling it off? The odds are against him. He’s a bold player in a very risky business. But even if he should fail, as well he might, he has shown the world the way to move forward. But it is up to people like Ron Howard to show where the path leads. The world needs heroes, but it needs poets even more — because it is poets who summon heroes, and the heroic qualities that lie within nations, to their calling. Poets are the legislators of mankind. 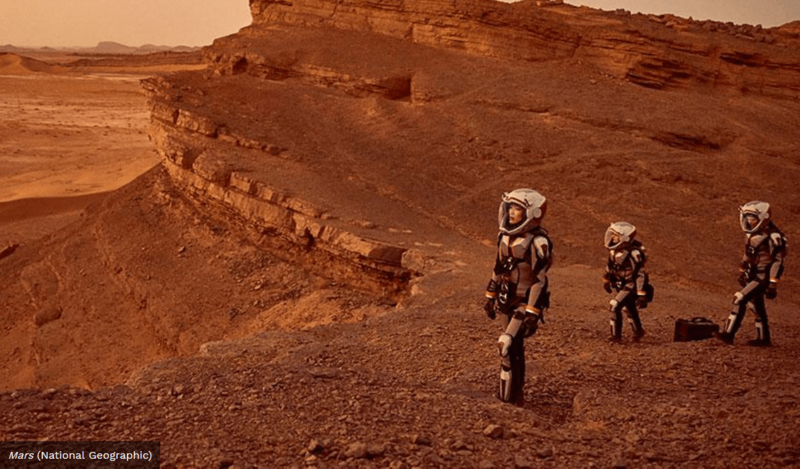 Mars premieres on National Geographic television November 14. — Robert Zubrin is president of Pioneer Energy of Lakewood, Colorado, and the author of The Case for Mars. The paperback edition of his latest book, Merchants of Despair: Radical Environmentalists, Criminal Pseudo-Scientists, and the Fatal Cult of Antihumanism, was recently published by Encounter Books. Copyright © 1998–2019 The Mars Society All rights reserved.